A highly fragmented global vitreous tamponades market is distinctive in terms of dominance of a select number of players in each region. Keen players in the market have given thrust to research and development to introduce newer products to serve the demand for case-specific products for specialty medical procedures. The global market for vitreous tamponades is primarily driven by the increasing incidence of retinal detachment, diabetic retinopathy, macular pucker, and other retinal disorders. As per statistics of the International Diabetes Federation, around 300 million diabetes cases were reported in 2010 globally and it is estimated to reach 438 million by 2030. The rising incidence of diabetes that is related to be a major cause of diabetic retinopathy and other retinal disorders is stoking the demand for tamponades to prevent impaired vision and even blindness. Besides this, the growing geriatric population that is more susceptible to retinal breaks is also a key factor boosting the growth of vitreous tamponades market. 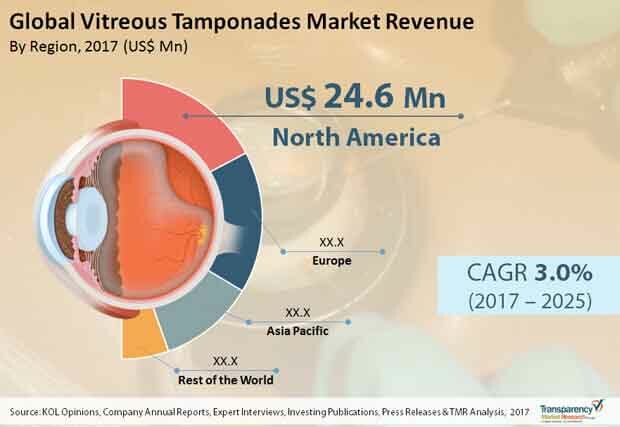 A report by Transparency Market Research (TMR) estimates the global vitreous tamponades market to attract a revenue of US$89.9 mn by the end of 2025 from US$69.3 mn in 2016 at a CAGR of 3.0% for the forecast period between 2017 and 2025. The report studies the global vitreous tamponades market on the basis of product type, end-user, and geography. Based on product type, the global vitreous tamponades market is divided into gaseous tamponades and liquid tamponades. Vis-à-vis revenue, of the two, liquid tamponades segment led the global vitreous tamponades market in 2016 accounting for 53.9% market share. The supremacy of the segment is due to the extensive use of liquid tamponades in European and Asian region for the treatment of retinal detachments, giant tears, proliferative diabetic retinopathy, and proliferative vitreoretinopathy. The segment of liquid tamponades has been further sub-segmented into silicone oil and perflurocarbon liquid. Of the two, silicone oil is anticipated to surpass in terms of growth rate during the 2017-2025 forecast period. On the other hand, the perflurocarbons liquid segment is likely to witness constant growth over the 2017-2025 forecast period as they are primarily used for the reattachment of giant retinal tears. Gaseous tamponades, on the other hand, is expected to display the leading growth rate in the upcoming years. This is mainly because of low risk of emulsification, low cost, and ease of use. SF6, C2F8, and perfluropropane are the most common types of gaseous tamponades used in vitreoretinal surgeries worldwide. These gases offer advantages of being expansive that allows the retina and eyeball to gradually adjust to the occupying volume of the eye for better healing. Based on end-user, the global vitreous tamponades market has been segmented into hospitals and ophthalmology clinics. Of the two, ophthalmology clinics held the leading share of the market in terms of revenue in 2016. In terms of geography, the global vitreous tamponades market has been segmented into four major regions: North America, Asia Pacific, Europe, and Rest of the World. Powered by the U.S., North America held supremacy in terms of revenue over other key regions in the overall market in 2016. In the U.S., retinal detachment accounts as a major cause for morbidity with an incidence of 10.1 to 17.9 per 100,000 individuals. Asia Pacific, on the other hand, is anticipated to emerge as a promising region and display increased market share over the forecast period from 2017 to 2025. Leading players in the global vitreous tamponades market include Novartis AG, Valeant Pharmaceuticals, Dutch Ophthalmic Research Center B.V., AL. CHI. MI.A srl, Fluron GmbH, and Carl Zeiss Meditech AG. This report on the global vitreous tamponades market analyzes the current and future prospects of the market. The report comprises an elaborate executive summary, including a market snapshot that provides overall information of various segments and sub-segments. The research is a combination of primary and secondary research. Primary research formed the bulk of our research efforts along with information collected from telephonic interviews and interactions via e-mails. Secondary research involved study of company websites, annual reports, press releases, stock analysis presentations, and various international and national databases. The report provides market size in terms of US$ Mn for each segment for the period from 2015 to 2025, considering the macro and micro environmental factors. Growth rates for each segment within the global vitreous tamponades market have been determined after a thorough analysis of past trends, demographics, future trends, technological developments, and regulatory requirements. A detailed qualitative analysis of factors responsible for driving and restraining market growth and future opportunities has been provided in the market overview section. This section of the report also includes market attractiveness analysis that provides a thorough analysis of the overall competitive scenario in the global vitreous tamponades market. Market revenue in terms of US$ Mn for the period between 2015 and 2025 along with the compound annual growth rate (CAGR %) from 2017 to 2025 are provided for all the segments, considering 2016 as the base year. Market size estimations involved in-depth study of services and product features of different types of services. Additionally, market related factors such as rise in incidence of vitreoretinal disorders, increase in geriatric population, and rise in health care infrastructure have been taken into consideration while estimating the market size. The vitreous tamponades market has segmented into three categories, namely by product type, by end-user and by region. Geographically, the global vitreous tamponades market has been segmented into four regions: North America, Europe, Asia Pacific, and Rest of the World. In addition, the regions have been further segmented by major countries from each region. These include the U.S., Canada, the U.K., Germany, France, China, Japan, and India. The report also profiles major players in the vitreous tamponades market based on various attributes such as company overview, financial overview, SWOT analysis, key business strategies, product portfolio, and recent developments. Key companies profiled in the report include Novartis AG, Valeant Pharmaceuticals International, Inc., Carl Zeiss Meditec AG, Dutch Ophthalmic Research Center B.V., Fluoron GmbH, and AL.CHI.MI.A Srl and others.